For the second day of women's action at the London Olympic Basketball tournament the big story was Belinda Snell's incredible buzzer beater for Australia from well beyond the half-way line against France to force overtime. 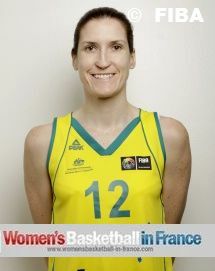 However her effort to bring Australia back into the match was in vain as France picked themselves up to win (74-70). In the other matches at the OLYW (Olympic Women basketball tournament), China continue to impress in Group A with a comfortable victory against Croatia (83-58). Turkey made it two out of two by seeing off European rivals, the Czech Republic (61-57). In the final match of the day the USA defeated Angola (90-38). In Group B, Russia remain on course for a place in the quarter-final with a victory against Brazil (69-59). Canada recorded their first victory of the competition by beating the hosts Great Britain (73-65). The USA, Turkey, Russia and France are one win away from booking their places in the quarter-final matches. In 1996 Ukraine won against Australia in an Olympic basketball tournament. 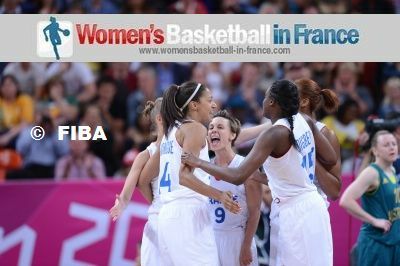 Since that defeat only the USA had managed to beat them until 30 July 2012 when France came away with an overtime victory (74-70). The first 20 minutes of the game were not exceptional with a combined total of 7-from-21 shots hit. All the same France were in front (28-27). After the break the game changed and the fans in the arena were treated to a women's basketball match, almost at its best. France went on the attack with Emilie Gomis on fire. She scored 14 points to help France go 10 points clear (46-36) five minutes into the third quarter. The game became more and more physical and Liz Cambage felt the full force of a collision with Gomis. 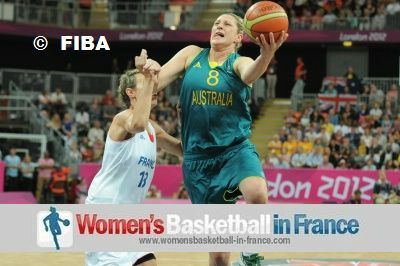 France had a maximum lead of 13 points before Australia with Jenna O'Hea, Belinda Snell and Lauren Jackson came back to (51-52) by the end of the quarter. The 4th quarter was exciting end to end basketball and with three minutes left in regulation time Jackson had put Australia in front (61-59). However Australia were unable to hold on to the advantage. With 46 seconds to play Emméline Ndongue slipped a ball to Sandrine Gruda under the basket for an easy lay-up. Leading (64-61) France were almost home and dry. But when Gomis somehow missed the unmissable lay-up Australia had a chance to equalise with about four seconds to play. Dumerc quickly fouled Snell who then went to the free-throw line. She hit the first and missed the second. Unfortunately for Snell, her team-mates did not get the rebound and then had to foul Isabelle Yacoubou-Dehoui. If Yacoubou-Dehoui had hit both free throws France would have won the game. However she missed the second one and Abbey Bishop picked up the rebound and gave the ball to Snell who then took two steps and released the ball from at least four big steps behind the half-way line. The shot banked in off the back board (65-65). With Cambage and Jackson fouling out during the 4th quarter, Australia's fire power in overtime came from Suzy Batkovic (in picture) whereas for France Gomis was still playing to her strengths. Yet it was a steal with about seven seconds to play by Dumerc that finally opened the path to victory. It took Australia four seconds to foul Dumerc who then hit both free throws. Australia needed a 4-point play but ended up not scoring. 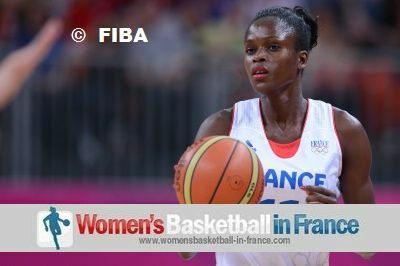 Top scorers for France were: Gomis with 22 points, Dumerc followed with 13 points while Yacoubou-Dehoui added 10. For Australia Batkovic had 17, Jackson 13 and Cambage 12 points. Emilie Gomis does not like talking about her performance during tournaments so she kept her response simple. She explained that during the first half of the match she was not in the match but things changed quickly within the team. She simply took advantage of the systems set for her to score 16 points during the third quarter. Gomis added that the victory was based on defense and for the moment as good as the victory was the objective remained the same: to qualify for the quarter-final. Isabelle Yacoubou-Dehoui said after the game that the objective was to play at the maximum and if necessary take risks for the team. By this she implied that she had to stop Liz Cambage from scoring. Belinda Snell is known well by Pierre Vincent because she played under him for one season with Bourges Basket. She said during the press conference about her shot: "I probably hit a few of those messing around with mates but none this big." As for the game she concluded: "The game was a roller-coaster ride and we just came up short."